UK shortsea specialist Scotline has initiated a further stage of fleet modernisation by ordering a 90m, single-deck cargo vessel in the Netherlands from the Royal Bodewes Group, writes David Tinsley. The 4,785dwt newbuild is scheduled to be launched in September 2018 and delivered in November 2018 as Scot Carrier. The deal includes an option on a second, identical vessel. 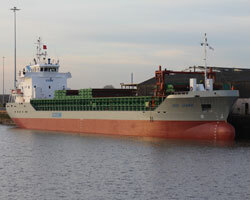 The design will be similar to that used for the company’s 4,500dwt Scot Leader, completed by the same Dutch builder in 2007 (pictured, right). As with Scotline’s eight owned vessels in its current, 11-strong fleet, Scot Carrier will sail under the UK flag and be deployed in the company’s service network linking Scandinavia, the Baltic, the northwest Continent and the British Isles, while offering added scope in the spot market. The newbuild will feature a single box-like hold of approximately 62m in length, full-width hatchways without overhang and pontoon-type hatch covers strengthened to take weather deck-borne cargo, incorporating special fittings for timber and containers and provisions for grain separation. Scot Carrier will accordingly be well suited to the company’s core trade in timber, wood pulp and other forestry products, as well as for spot business with bulk commodities and large and indivisible project loads. Intended certification to the Swedish/Finnish ice class 1B standard reflects the operational demands of providing year-round transport to the Baltic region, including Scotline’s traffic to and from the eastern Baltic States. As necessitated by trade to ‘drying’ berths in coastal and river ports, the hull will be strengthened for loading and unloading while aground. Scot Carrier’s all-up timber load capacity will be in excess of 6,500m3. By comparison, the respective value for Scot Leader is 6,325m3. The existing vessel has a 221teu container rating, and a similar capability will be embodied in the new ship. The specified primary power installation is a 6-cylinder MaK M25C medium-speed propulsion engine, rated 1,850kW for a service speed of around 12knots. Manoeuvring in small ports and rivers and at restricted berths will be enhanced by a 300kW bow thruster. Scotline strengthened its fleet in 2017 through the commissioning of the 3,700dwt Scot Navigator, a fuel-efficient coaster built in the Netherlands by GS Yard. The design employed is a derivation of the Sea-River Liner 3700 type developed by Groot Ship Design in cooperation with GS Yard and Dutch shortsea operator / manager Wijnne Barends. Scot Navigator is currently maintaining Scotline’s liner service schedule from the Swedish west coast port of Varberg to Gunness, on the River Trent in eastern England, and includes other UK loading points for the return eastbound voyage to Varberg. Located on the Kattegat, Varberg is Sweden’s leading export point for sawn timber and other forestry goods, and also receives pulp logs from Scotland shipped in Scotline vessels.